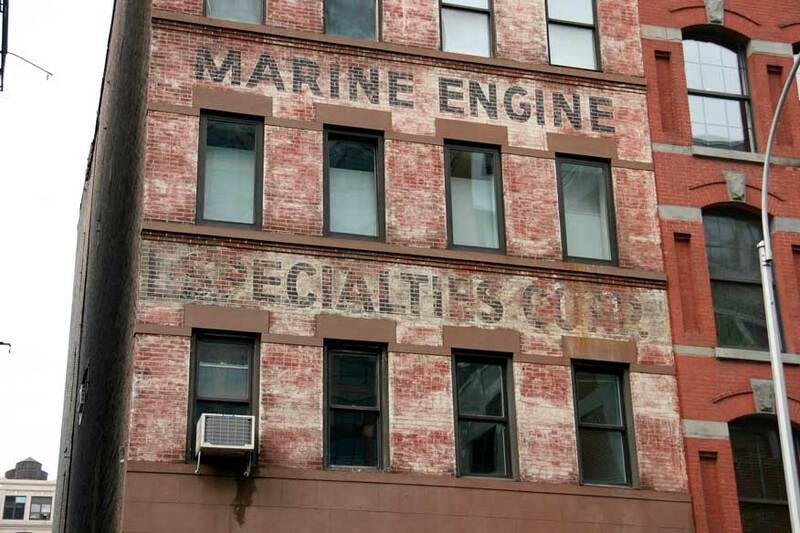 The Marine Engine Specialties Corp. was located in New York City from 1948 to 1969. They occupied this building on Broome St. near the entrance to the Holland Tunnel from 1950 until 1969 when they moved to 5 Central Ave., Clifton, New Jersey. Marine Engine Specialties (aka Mesco Tectonics Inc.) manufactured "industrial and marine heat exchangers, manifolds, hoists, deck machinery and other marine products and equipment" (The Maritime Reporter, 15 Nov. 1971, p. 15). Owner and founder of Marine Engine Specialties was Edwin Burke. Two posts on Frank Jump's Fading Ad blog by Edwin Burke's children summarize the little we know about the company. "Marine Engine Specialties Corporation was owned and run by my father, Edwin Burke. He had the main office on Broome Street in NYC and also one in San Francisco as well as various others that came and went. He eventually moved most of the NY operation to NJ and shortened the name to MESCO, but it went out of business in the early 1970s after he died. - Leslie Burke Barratt"
"I'm Ed Burke's son ... As my sister pointed out Broome St. was the headquarters, there was a full office in San Fran and at various times there where [sic] branches or affiliates in Texas and other sites. In 1966 dad sold Broome St. to the artist Claus Oldenburg and MESCO moved to Clifton N.J. He died in 1971 and the company folded the next year. - Phil Burke"